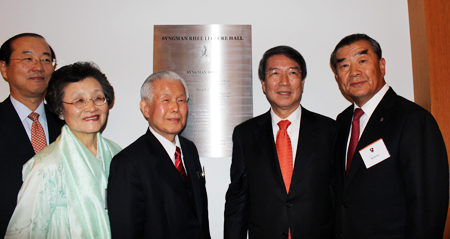 Princeton University has dedicated a lecture hall in honor of Syngman Rhee, the first president of South Korea. The Syngman Rhee 1910 Lecture Hall was opened at the American university’s Woodrow Wilson School of Public and International Affairs in New Jersey on Wednesday. The Princeton University Korean Alumni Association initiated the dedication of a campus space to Rhee in recognition of the former president’s role in founding the nation. The association raised about $500,000 to fund the hall to mark the 100th anniversary of Rhee receiving his Ph.D. He graduated from Princeton with the doctorate in politics in 1910. He became the first Korea to earn a Ph.D. from a U.S. university. Kim Jong-seok, the president of the association, held a ceremony to celebrate the dedication at the hall. The event was attended by former Prime Minister Chung Un-chan who earned a doctorate in economics from Princeton in 1976. Former Korea University President Lee Ki-soo, head of the First President of Korea Dr. Rhee Memorial Foundation, also took part in the opening. Also on hand was Rhee In-soo, adopted son of the late President and professor emeritus of Myongji University. 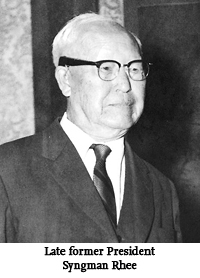 After the ceremony, Chung, who once served as president of Seoul National University, said in a lecture that Rhee provided the building blocks for Korea to develop into what the nation is today.